Clementine & Five-Spice Chicken ~ Rachel | Losing It! Eating Well is one of my favorite magazines, mostly because the recipes are tasty, healthy and quite simple. In the latest issue, there was a recipe for Clementine & Five Spice Chicken. Since I had just bought a giant box of clementines, I was all set to make this recipe. And it was fantastic. So flavorful! 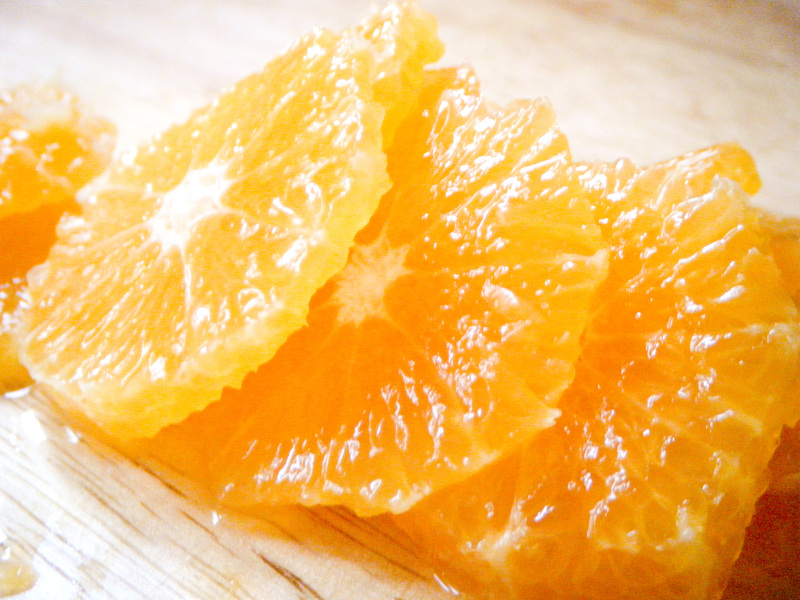 Finely grate 1 tsp zest and squeeze 1 cup juice from 6-8 clementines (make sure to reserve 2 clementines for slicing). Combine the zest, juice, and five-spice powder in a small bowl. Heat oil in a large nonstick skillet over medium-high heat. Season chicken with salt. Cook the chicken, turning frequently, until brown on both sides, about 5 minutes. Pour in the juice mixture and bring to a simmer. Reduce the heat to maintain a simmer, cover and cook the chicken is just cooked through, 16-18 minutes. Meanwhile, peel 2 clementines and slice into 1/4-inch rounds. When the chicken is done, transfer to a plate and tent with foil to keep warm. Increase the heat to high and cook the sauce, stirring often, until thickened and reduced to 1/2 to 2/3 cup, 2-4 minutes. Stir in the clementine slices, cilantro, scallion greens and sesame oil. Serve the chicken with the sauce. 84$ daily value of Vitamin C! I served this with some fresh spinach, sauteed with garlic and olive oil until wilted, and a serving of Trader Joe’s Harvest Grain blends. I was a bit apprehensive about this grain mix because Dave can be picky. After dinner…because he didn’t say anything during…I asked if he liked dinner. He loved everything except the seasoning I put on the spinach. He really liked the grains! I then told him it was a mix of Israeli couscous (which we knew he liked), orzo, red quinoa and the kicker: baby garbanzo beans. I was sure he was going to ban them from the house. Dave doesn’t do beans. Ever. But all he said was ok. Anyways, the grain mix was quite tasty, had a nice mix of textures to it and was very creamy (I made it using chicken broth). I highly recommend this blend if you’re looking for something a little bit different! I bet it would be good in a soup of some kind. Like a modified wedding soup. Biz, you up for that challenge? 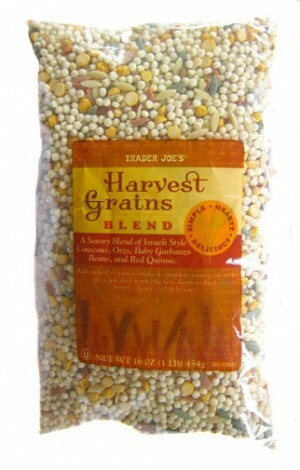 If you don’t have TJ’s by you, I’ll ship you a bag of this stuff to try! Overall, a tasty and healthy dinner that took very little effort! Today has been another story. We went out for lunch and I got a burger. I have the points for it but it does take away some of my points cushion for the rest of the week! Oh well. The burger was fantastic. We’re going to ration out the goodies we got at the German bakery and the Chocolate Boutique (which just opened up by Savory Spice Shop). I’m still tracking it all. If I bite it, I write it! Home now – love, love, love your chicken dish idea – I have everything for it, except I’ll use chicken breasts instead of chicken thighs, just a personal preference. I have a TJ’s by me – I’ll have to put my thinking cap on for a soup using it.